Unidad 3, Nivel 21, Estrato IIIf2 (Muestra A). Esta muestra fue refechada para comprobar su exactitud--vea la AA-93164. 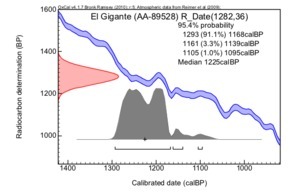 2010 AMS Radiocarbon dates for maize samples from El Gigante Rockshelter, Honduras. Unpublished preliminary report submitted to K. Hirth and D. Webster. On file with Department of Anthropology, Penn State University, and Laboratory of Archaeology, University of B.C, Vancouver.